In this review, we present the Best Vertical Climber Machine that allows you to perform a comprehensive full body workout as efficiently as possible. Imitation of movements of the climber allows you to actively use the muscles of the legs, arms, lower back, as well as to include many other muscles in the work. The functionality of most models is similar, but there are important details that you should pay attention to when choosing. This review will help you find the best option for yourself and make it easier to make a purchase decision. First, the vertical climber machine is more efficient in calories burned. The exercise involves many muscle groups. Training is very effective and you spend a lot of energy. In addition, the main exercise for training is quite simple. Even the most inexperienced beginner will be able to start training immediately after the acquisition. At the same time, it is safe. You prevent injuries and overloads. Finally, it is a simple and inexpensive simulator. It is easy to place in a small apartment. When folded, it will not take up much storage space. 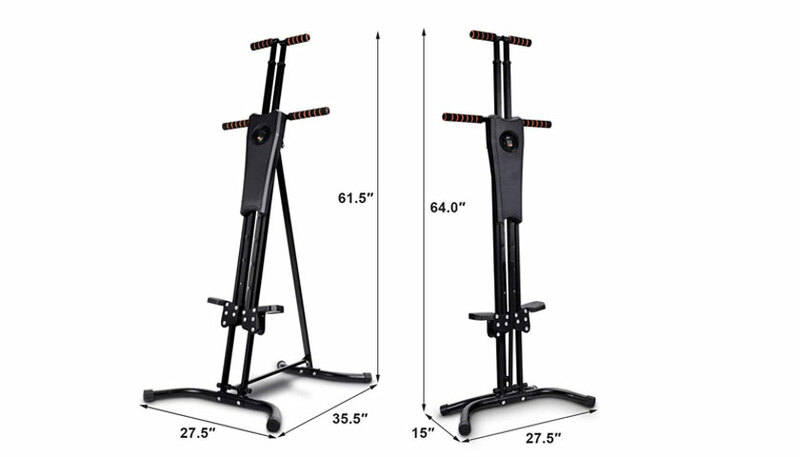 Why did Vertical Climber Exercise Machine become so popular? Many people want to lose weight. At the same time, they want to get the result as quickly as possible. They are ready to put a lot of effort, but no one wants to waste time. This equipment is more effective than many alternatives allows you to burn calories, tone many muscle groups. Besides, it’s a great cardio machine. Its regular use will help to become harder. MaxiClimber Vertical Climber allows you to perform a workout comfortably and efficiently. The frame is made of durable steel pipe. The shape of the legs is stable and safe for the floor surface. Comfortable footrests with the non-slip coating are comfortable for the foot. The foam-coated handles are comfortable and safe to brush. You can simply hold onto the bottom pair of handles or use the movable grips. Using the equipment is convenient. It is sold pre-assembled. You will need to connect the nodes and start training. To track the results on the equipment there is a screen with the training data. In addition, the manufacturer has provided a special application with a training program. This will allow you to quickly learn and use Vertical Climber in your training. You can fold the frame for more convenient storage. Merax Vertical Climber Fitness Machine 2.0 is one of the best in terms of quality, strength and affordable cost. Able to withstand users up to 350 lbs and maintain good stability. The frame is made of high strength square steel pipe. The handles and footrests are also durable and safe with non-slip surface. Before use, select the desired height. It is possible to adjust according to their 5 options. The results of your training will be recorded by the control system. And the digital screen will show the number of exercises performed and the amount of calories burned. This makes the training more effective. You can create a training calendar to record the results and set new goals. The Best Choice Products Total Body is a 2-in-1 Vertical Climber and Exercise Bike. More complete and varied cardio for better results. Among the advantages of this model is good quality and strength of the frame. It is designed for a user weighing up to 330 lbs. On the legs are plastic tips that will protect the floor from scratches. The upper handle is double. This will keep the most convenient way. For Exercise Bike, the resistance level is selected and the seat position is adjusted in height. The training results are displayed on a digital display. Total Body 2-in-1 takes a little more space than other models. But for convenient storage, it can be folded. With it, you can get a more complete and varied workout. Effectively burning calories you get tightened legs and buttocks, bring in good physical shape all the muscles of the whole body. Goplus Vertical Climber Folding Stepper is a high-quality low-cost model. It is possible to adjust the height of the handles. The surface of the footrests is corrugated and non-slip. The handles covered with foam are comfortable for a secure grip. The robust frame construction withstands a user up to 243 lbs. When the Climber Vertical storage takes up less space it can be folded. This model has a modern design. Although the Assembly should not cause difficulty detailed instructions included. Sunny Folding Climbing Stepper is an analog of the equipment under consideration. It is often considered as an alternative due to some advantages over standard Vertical Climber Machine. One of its advantages is the shape and size of the footrests. The user more confidently trains and is not afraid that the leg will slip. The presence of hydraulic pistons makes it possible to select the level of resistance. So you can adjust and change the load on certain muscles. An additional advantage of this equipment is more compact size. This option is suitable if your main goal is training legs and buttocks. The lack of active involvement of the hands when performing exercises makes training less complex. Such equipment in most cases allows you to perform the basic exercise simulation of the movement of the climber. It involves the hands of the feet and hands, as well as the body. To exercise was more diverse, you can use a different amplitude of movement. To reduce the load you can not use the upper movable handles and hold on to static handles. So the exercise will be like training with a stepper. Part of the Vertical Climber Machine allow you to adjust the difficulty. In this case, you will be able to train in cardio or power mode. 5 minutes: Warm Up. It can be light aerobic movements, squats, jumping rope. This set of exercises is given as an example. Perhaps it will not suit everyone. Training time can be great by increasing the intervals of rest, if the specified time you do not have time to restore breathing and return to the middle pulse zone. If you decide to purchase such equipment, we recommend you to pay attention to a number of factors. Determine for yourself the priority characteristics and how much you are willing to spend on the purchase. To assess the quality, pay attention to the Weight Capacity and warranty conditions. To Vertical Climber Machine remained stable better to your weight was not close to the maximum possible load. So whether you complete the exercise, check the height of the arms. It will be good if it is regulated. Quite often, users complain about the complexity of the Assembly. This is odd since most models arrive almost assembled. But just in case, specify what is included. Sometimes these are training recommendations, which is also useful. The dimensions of this equipment may vary. It will be better to take into account and compare your height with the size of Vertical Climber Machine. This will provide the convenience of exercise. We hope you will be able to choose the best vertical climber exercise machine and make a bargain. #Q: WHAT HEAVY-DUTY MODEL WOULD YOU RECOMMEND? In our review was Merax vertical climber machine she has a Weight Capacity of up to 350 lbs. We can recommend to pay attention to it. #Q: HOW TO USE VERTICAL CLIMBER MACHINE? This equipment is more suitable for girls or boys can also do? Would it suit me if I wanted to lose weight? You can also use the Vertical Climber Machine to lose weight. Consider Weight Capacity. With this equipment you will get an excellent cardio workout. Good Luck!